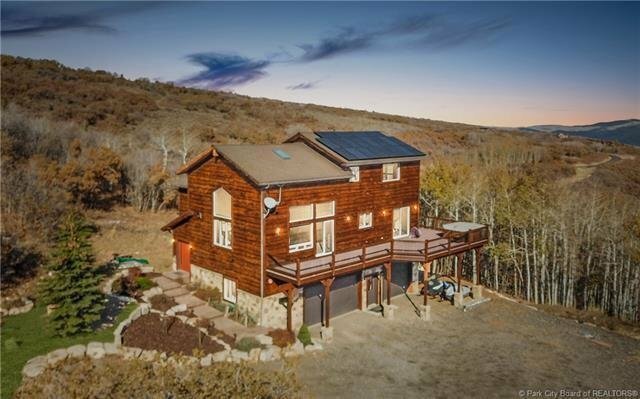 5 Bedroom, Custom Home with Top of the World Views Excellent primary residence or second home with south-facing panoramic views. This 5 bed/4.5 bath, with extra-large wrap around deck and hot tub, is on 8.8 wooded acres. Home is in excellent condition and enjoys recent upgrades and PV Solar (20 panels) with net metering. Great room with vaulted ceilings, hardwood floors; kitchen has new stainless appliances. Granite countertops throughout. Oversized 3 car garage accommodates rec vehicle. Very good year round access, on the plow route, flat driveway. Park City School District. Gated community, just minutes from Kimball Junction, and yet with a wonderful sense of being away from it all. Stagecoach residents love being surrounded by wildlife and summer & winter recreational activities just outside your door. Old Republic Home Protection Standard 1 year home warranty is included.